A special fundraising event is a great way to raise money for a cause you are passionate about. It can also help raise the awareness in your community about the issues you want to improve. However, it is important to properly prepare for the event if you want it to be successful. 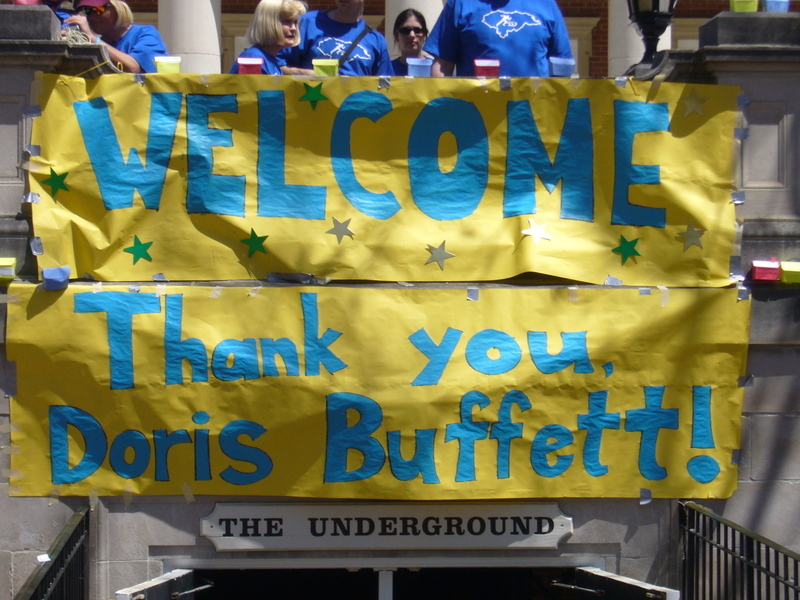 A significant amount of planning and work goes on behind the scenes of any fundraising event. The events that go smoothly and appear to be easy are usually far from easy. It is due to the hours, days and months of planning and preparation of many committed individuals. I was reminded of this a few days ago as I participated in an event that raised money to build homes in Honduras. The Walkathon for Hope was made possible by the nonprofit organization Students Helping Honduras. The event had 2,000 participants and raised its goal of $200,000 to build 72 houses in the village of Siete de Abril in Honduras. We walked ten miles on the day of the event. I am proud to have been a part of it. The cause you are raising money and awareness for needs to be something people can get enthusiastic about. The actual cause is important, but so is how it is presented. For the Walkathon, pictures and stories of children in the refuge village they were going to build homes in were used to motivate people to participate. They also let you know the specific amount ($2,800) it would cost to build each permanent home for a family. It was definitely a cause many people could get excited about. Consider how you are going to present the reasons you are holding a fundraiser and asking for donations. The location of your event needs to be convenient and clean. It shows that you care about your cause and the people who support it. I have attended outdoor events that had long, uncut grass and trash all around. I have been to indoor events that were held in buildings and rooms that were not clean. I am sure there were people who left once they saw the poor conditions. For those that stayed, I suspect some of them refused to attend any future events. 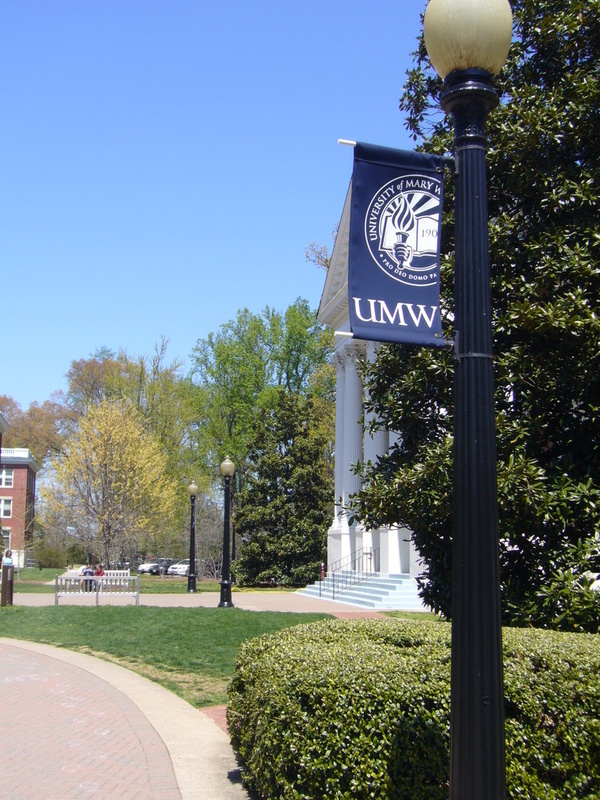 The walk I attended was held on the campus of the University of Mary Washington. It is a beautiful campus. The campus is located in the historical city of Fredericksburg, Virginia. The Jeffersonian architecture featured throughout the campus provided a historical backdrop for participants to experience before, during and after the walk. The landscaping was well maintained and parking around the campus on a Saturday afternoon was plentiful. Make sure the location you select for your event shows how passionate you are about the cause and how important the participants are to you. You can't control the weather. However, you can select a date during a part of the year that is most appropriate for your event. You also need to consider when people are willing and able to attend. For example, many people might not be available due to holidays, going out on Friday nights or going to church on Sunday mornings. There also could be other competing events scheduled for that same date and time. Consider people's schedules and community calendars in your area before you set the date and time. The weather during the Walkathon for Hope was great for a walk. It was warm with blue skies on the day of the event. Scheduling the walk during the middle of April in Virginia made this possible and even likely to occur. I was surprised to discover the Walkathon for Hope was scheduled in the afternoon. Most walks I have participated in were held during the morning hours. However, after thinking about it I realized it was a great decision. 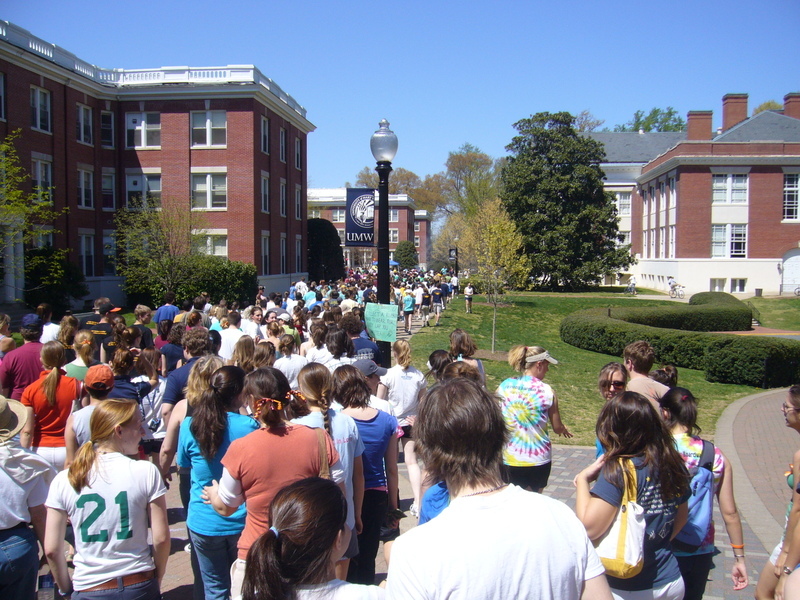 The participants during the Walkathon were mostly college students. They were more likely to have a terrific turnout in the afternoon from the students. It also allowed adequate time for the teams from other colleges in the state to travel without being on the road in the middle of the night. Consider all of the factors regarding your event and those you want to attend when setting the schedule. You are going to ask people to take one or more hours out of their busy schedules to attend your event. Many are going to ask themselves "what's in it for me?" when deciding on whether or not to attend your event. Providing entertainment that they will enjoy gives them something they seek and will encourage them to attend your fundraiser. If you're familiar with the Law of Reciprocity, you will realize the attendee will be more likely to participate generously in your event if you've provided something they want first. The Walkathon had entertainment galore. 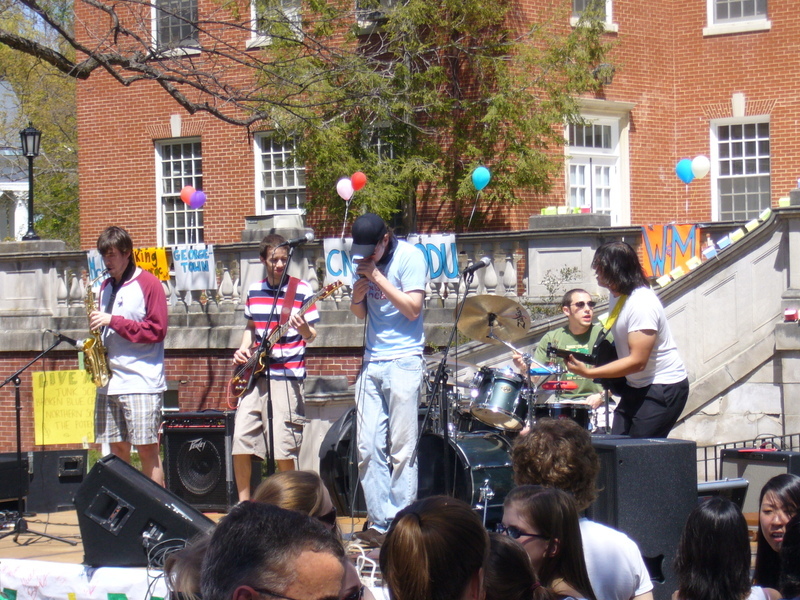 Musical groups performed before and during the walk. There was also entertainment on the walk path. Guitarists, drum groups, dance teams and an improvisation club all entertained us as we walked. There was even a station set up to get a massage! Think about the participants you're targeting for your event then schedule entertainment they will enjoy. There is a saying "the way to a man's heart is through his stomach." I believe this is true for participants at events as well. Serving refreshments for short events and meals at longer events will add to the enjoyment. You don't have to go expensive with the food (unless it is something like a black tie event). Attendees know the real purpose of the event is to raise funds and going overboard with the food could leave a negative impression. 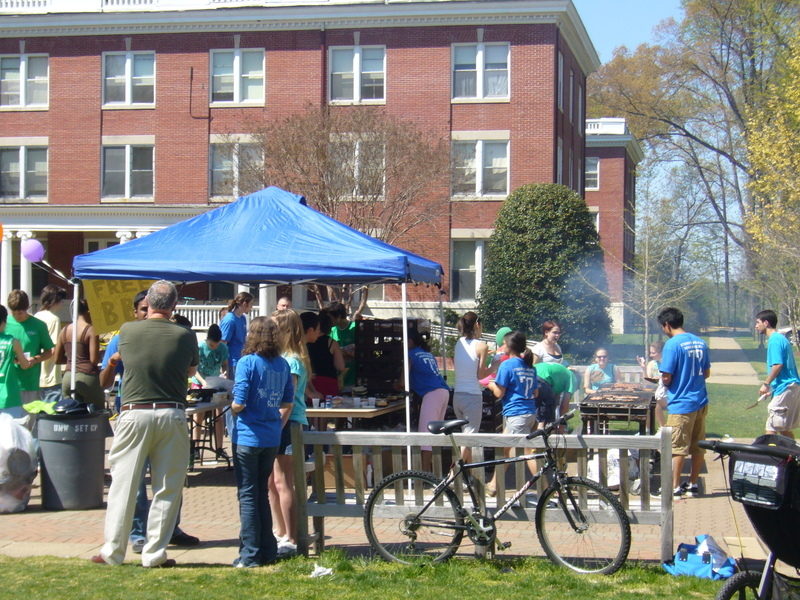 Students Helping Honduras arranged to have hot dogs and hamburgers grilled onsite and available throughout the event. Water was provided at several points on the walk. I heard walkers throughout the event talking about when and how many times they should stop to get a hamburger or hot dog. Obviously, the grilled food was a hit. Don't forget food and refreshments for your fundraising event. Consider finding a sponsor that would provide it at no cost to your event except for you to announce their generosity to others in a variety of ways. The work becomes easiest when there are plenty of volunteers helping out. There are many skills needed to put on a successful event. Don't try to plan and prepare the event by yourself. The event will suffer. Consider all of the things that need to be done and recruit volunteers to make it happen. Many months of work by a motivated team of volunteers went into the Walkathon for Hope. This volunteer team covered areas including administration, copywriting, public relations, logistics, finances, setup and cleanup. Invest adequate time and effort in recruiting volunteers early. Having a great team of volunteers will not only make each person's responsibilities easier, but it will also keep the team motivated right up to the day of the event. Finding ways to have teams participate will encourage participation. Some people may not readily join by themselves but they wouldn't think twice about participating if they were doing it as a team with friends and coworkers. When people are part of a team, they motivate each other to do their best. Where do you look for teams? You can recruit teams from places including schools, religious organizations, companies, and clubs. Fundraising for the Walkathon was centered around teams. People were encouraged to build teams to raise the needed funds. These teams were recognized at the beginning of the event. I am aware of several teams that participated from religious organizations and schools. Some of the college teams traveled several hours just to participate in the event. Find ways that teams can participate in your fundraising event. 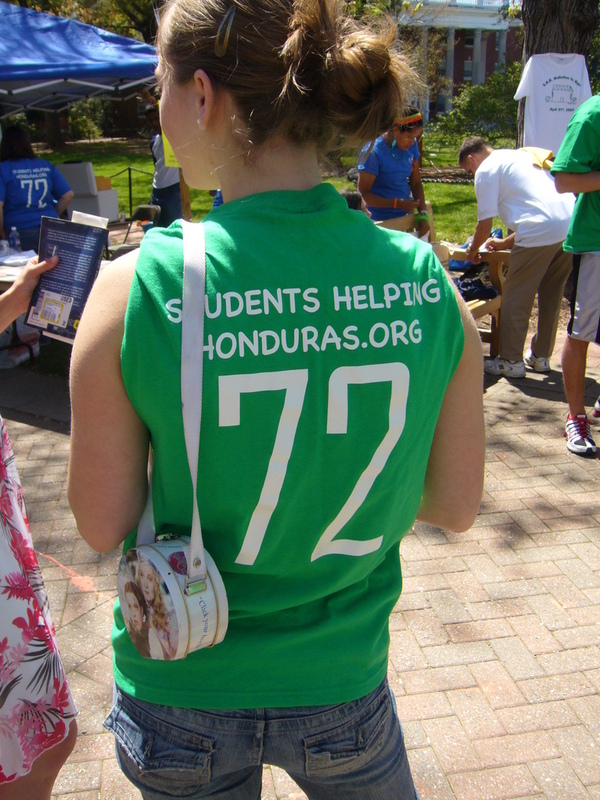 Students Helping Honduras used many of these methods to let people know about their fundraising event. I personally watched a television interview, read articles in the local newspaper and saw fliers posted in the community advertising the Walkathon for Hope. However, the first time I heard about the event was not through any of these methods. I learned about the event online. Students Helping Honduras also used Web 2.0 techniques to alert others about their event. I initially found out about the walk on myspace.com. A quick search on the Internet showed they initiated a significant promotion across many websites and blogs. Build a plan for promoting your event early. Be creative in the ways you get the message out to your potential participants. The more incentives you can give people, the more likely they will pull money from their wallets and make a contribution. Certainly the great feeling the donor will receive by donating to a worthy cause is one tremendous incentive. There are others to consider. Why not offer door prizes, auctions and raffles? Another incentive I have found that works well is finding sponsors that will match funds being donated by others. The Walkathon for Hope covered many of these incentives. They auctioned off items prior to the event and sold t-shirts and other items at the event. They held a raffle for items including a video game system. Most importantly, they had a sponsor, Doris Buffett from The Sunshine Lady Foundation, who agreed to match funds so that if they could raise at least $100,000 they would receive the total $200,000 goal to build all 72 houses. Identify several ways you can provide an incentive for people to promote, attend, participate and raise money for your event. When all of the above elements come together, participants can't help but have fun and feel great about making a difference. Don't forget to have fun with the volunteers and participants when you are doing the planning and work to make the event a reality. Yes, putting on a successful fundraising event is hard work. It is also worth doing the work when you realize you have the ability to make a difference. Roger Carr is the founder and owner of Everyday Giving. Sign up at http://www.EverydayGiving.com to receive our special report "9 Questions to Consider Before Volunteering" for free. VolunteerMatch and Squidoo have joined together to sponsor a new photo contest. The contest winner will be able to name the charity that will receive a $1000 donation. The photos you submit need to capture the fun and impact of giving back. Acts of kindness occur all around us and they occur frequently. Capture those kind acts in photos and enter the contest. Don't worry if you are not a professional photographer. I'm certainly not and I entered my first submission today. Inform your favorite nonprofit organization about the contest so they can "motivate the troops"
Have fun and feel good about supporting a great cause. Even if your entries don't win, you will raise the awareness about your favorite cause just by doing this simple act. Don't wait any longer. Pick up your camera and start taking pictures of people making a difference. Submit your favorites to the contest. You will be glad you did. Giving money to charity gives us a great feeling, unless it turns out that we were victims of a scam. This presentation from the BBB aims to guide donors in making responsible choices and avoid becoming the victims of a scam. Volunteers make a positive difference in our lives and communities. They make our world a better place to live. If you are a volunteer, I want to thank you for your unselfish service to others. National Volunteer Week started today. It is a service of the Points of Light Foundation and sponsored by Target. 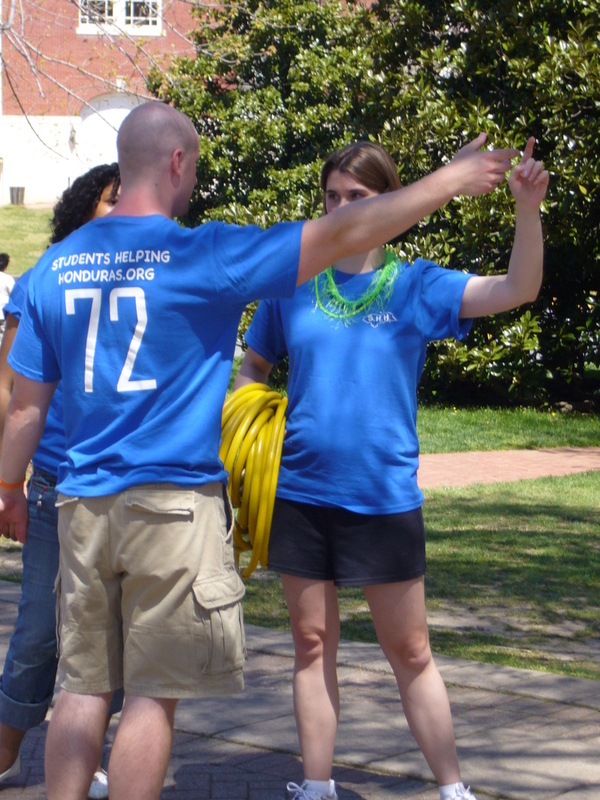 If you need some ideas on ways to recognize volunteers, check out the National Volunteer Week toolkit for 2007 at http://www.pointsoflight.org/programs/seasons/nvw/tools.cfm. More than 50 of the top Internet Marketers from around the world have teamed up to raise funds to help children with autism and related disorders. This online benefit is called "Marketers on a Mission." The Internet Marketers include Dr. Mani, John Reese, Yanik Silver, Jason James, Joel Comm and many others. All of the proceeds are going to the Pioneer Learning Center, a school dedicated to helping children with autism and other social behavior related disorders (including ADD and Asperger's Disorder). The Internet Marketers are not making a cent from this online benefit. The event starts at noon on April 14. Go to http://www.marketersonamission.org for more details. Age has nothing to do with a person's ability to change the world. Children continually impress me with the remarkable things they do to give back. They are passionate. They are creative. They are full of energy. A recent example I discovered is 7 year old Cassidy Lynn. She is passionate. She is saving kid's lives in Sudan by raising funds for KIDS FOR KIDS. They use the funds to provide goats to the poorest families in remote villages in Darfur, Sudan. These goats help provide the nourishment needed for the children to be healthy. She is creative. Cassidy designs, creates and sells unique cat toys to raise the funds. These cat toys are called Playful Pancakes. Each one is a different design, handmade by children, and given a unique name. She is full of energy. It is obvious that Cassidy is enthusiastic about this project. How do I know? She has recruited several friends to help create the Playful Pancakes. Consider supporting Cassidy in her fundraising efforts. Go to http://www.playfulpancakes.blogspot.com and check out the latest Playful Pancakes news.